The 9007 bulbs is common only to American and Japanese vehicles, commonly found in Ford and some Nissan vehicles. This bulb is dual filament by nature. This means the low beam and high beam have their own filament that turns on. 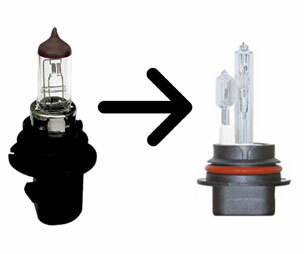 Unlike other types of bulbs, most vehicle which use a 9007 or also known as HB5, will only have 1 bulb per headlight. For HID models, 9007 comes in two types: Standard – Low beam is has HID function, and high beam is a halogen bulb. The other type is known as bi-xenon where the bulb is a single HID bulb that moves slightly in the headlight housing creating a low and high beam effect. There are various colors available. You can pick any to match your vehicle. 6000K = Pure White, 12000K = Darker Blue, 10000K = Blue Tint, 30000K = Purple, 4300K, 8000K, These bulbs are normally sold as a pair in order to ensure the color match.